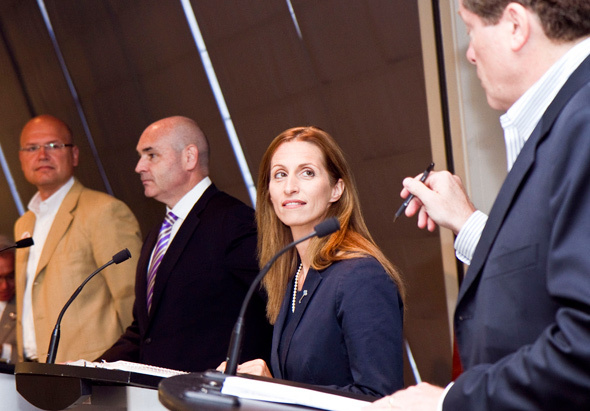 Sarah Thomson is going into the last hundred days of Toronto's municipal election as one of the top five candidates. But the rest of the campaign will be an uphill battle, as opinion polls have consistently put her behind George Smitherman and Rob Ford. The good news for her team is that the real campaign season hasn't even begun. In possibily a sign of things to come, at Tuesday's CP24 debate, Thomson was more aggressive than usual--apparently a necessary tactic in what's becoming a slug-fest campaign. In addition to reducing city spending, Thomson has built her campaign around expanding Toronto's subway system. Her plan calls for 58km of new subway instead of Transit City's 120km of LRT lines. The financing would include placing rush hour or congestion tolls on the Gardiner and the DVP, partnering with private developers, and issuing a special subway bond. Thomson wants to expand the Sheppard line to the Scarborough Town Centre and the University-Spadina line to York University, build an Eglinton subway line running from Kennedy station in the east to Pearson Airport in the west, and add a downtown relief line along Queen St. linking up with Pape and Dundas West stations. Thomson is 42 and was born in Toronto. At 18, she already managed and owned a company leasing service stations throughout Ontario, and by the time she turned 30, her business was a multi-million dollar operation. At 28, she had her first taste of politics when she ran and lost in a Hamilton city council race. Recently, in 2002, she established the Women's Post, a magazine geared towards businesswomen, which she manages to this day. Thomson has been married to her husband, Greg--director of Charity Intelligence in Toronto--for eight years. They have two boys, aged four and five and live downtown. And when Thomson isn't busy, with the Women's Post or campaigning, she can often be found relaxing at the Rebel House. It's been more than six months since you've entered this race and so far no poll has put you above third place. Does that bother you? No, not at all. We've spent no money on advertising...So the fact that we've got to third place, without advertising and without really spending any money, is pretty remarkable. Our goal right now is to move from third and go towards first. As long as we're first on October 25, that's what matters. Most of the race's candidates have adopted a fiscally conservative platform. Has this made it harder for you to stand out as a fiscal conservative? I'm actually pleased that we're talking about the waste of our tax dollars at city hall. People are addressing it now, so it was nice to be able to bring it out and get it as part of the dialogue. Do you think you've faced any disadvantages as a woman? I think a lot of people want change. And I'm getting a lot of people, both men and women, saying it's time we had a woman in the lead. So no, I don't think there are any disadvantages. There was a professor who said: "She's only there because she's a woman, " which was really frustrating because we've worked so hard, not just me but my whole team. And that was a little bit demoralizing for my team to hear that. To me, the fact that I'm a woman hasn't really hurt or added. It's really been a matter of people saying we need change, and a woman's face brings change. When you have 30 percent women in a boardroom it changes the dynamic. You don't have this "top dog" confrontational dynamic anymore. It turns into a more collaborative environment, so that's why I'm a strong advocate of more women at city hall. If you see a smart woman, vote for her. [Women bring] a more collaborative process; they're able to build consensus more, they tend to be multi-taskers, and they really look at "how?" more than "this is a great policy and it's great because of this..." Women tend to be more like: "yeah, great policy, but how are we going to do it?" How did the idea of running for mayor first come to you? My husband and I were on our way to the cottage and I heard on the radio that David Miller wasn't going to run, and I thought: I could do that job. And because the Women's Post has been so successful, the challenge from it was gone. I was looking at what I should do next and [for the next challenge]. You left home at 15. What happened? What does Conrad Black's endorsement mean to you? So I was reading [the endorsement article], and when I got to the last paragraph I was so surprised--because I've known him more on an industry level...through a little bit of competitiveness in a funny way, because he had this huge empire and I had my little magazine poking at his advertising dollars. I thought: "Wow, that's quite a tip of the hat to me." I went to him originally to see if he'd back me [financially for the Women's Post], and he said, "No, it'll never work." He's changed his thinking now. He's said, "hats off to you; you made it work." An endorsement from him is more of a personal pride thing where somebody that built an empire can recognize that I was able to build something on a smaller level that actually achieved success. And does it bother you that he's been convicted of fraud? Who knows what the courts will turn up...So I don't know what to think until the whole appeal process goes through. How do you think Bill Blair handled the G20? I don't think any of us know enough about what happened, and I believe there needs to be a civic inquiry into this. I think Bill Blair can learn from the civic inquiry, and it's essential so that we do not make the same mistakes again...If people's human rights were trampled we can never do that again...I don't believe in [having only an internal police inquiry], you need to have the public judging it. One of my volunteers, who was sitting in a restaurant, videotaped the police stopping a guy they were searching and were being really rough with. The policeman saw [my volunteer] and came into the restaurant and erased the tape. There's no reason for that...so that needs to be addressed. [However], I tend to be worried about a public inquiry, it tends to pay a whole bunch of lawyers and it gets drawn out over years. We need to address the issues now while there's still passion and interest in it. The original Transit City plans called for 120km of LRT lines, and your transit plan involves only 58km of new subway lines. Won't this mean denying many communities access to needed transit? My plan is only an initial phase of subway building...The people that need transit most--I'm talking about Rexdale and Scarborough--a lot of them don't really care about Transit City, which is surprising to me. I want to build transit out there. But transit is about getting from point A to B quickly...and surface transit [is slower than subways]. So yeah, my vision right now is only the 58km, which we're in desperate need of, but it doesn't stop there. The reason I'd put a rush hour toll on the Gardiner and DVP with a sunset clause is so that we don't stop...The clause means that they can only use the toll money to expand subways, and it has to come down if they stop building subways. Why do you think the province delayed the funding for Transit City? There's an election coming up, and I think the province heard what I heard: the frustration of Torontonians over the whole streetcar issue. People are frustrated by the fact that they're getting second best. I think province just said: "This is a hot potato...let's get out of that mess." I think if we go back with a better plan with subways I think the province will come back to the table. Finally, which former mayor do you think has accomplished the most for this city? I think in terms of bringing fresh ideas to the city it would be David Crombie. He was able to bring the youth into city hall--and that's something I want to do.